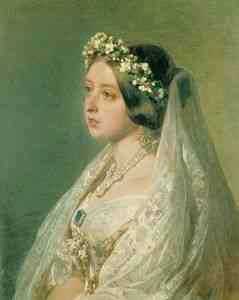 The history of the white wedding dress is one that has many versions of it, yet, they almost all are rooted in Queen Victoria. In the 18th century and earlier weddings were about political alliances and the transfer of wealth as opposed to romance like they are today. In that time, one of the most blatant ways that people could signify wealth was in textiles and the garments worn by members of society. The richer the fabric, the more elaborate the weave of the fabric, or the rarer the color would signify the higher status of wealth. Before the technique of bleaching fabrics was widespread, white was a very hard color to achieve and also to maintain. Queen Victoria chose to wear white to make a statement. Unlike many other royals who were princesses at the time of their wedding, Victoria was queen, the head of the state. In order to differentiate herself, she wore white as opposed to the traditional gowns of silver metallic materials. In addition, at the time of Victoria’s wedding, the handmade lace industry was dying sue to the invention of machine lace. Victoria, in an effort to revive and stimulate the industry in Britain choe to have a large piece of handmade lace on the skirt of her gown. Victoria’s gown made the statement of practicality and patriotism as opposed to purity which has been wrongly associated with Victorian brides since the 20th century. White gowns became a trend after Victoria and caught on in the 1850s and 1860s- this tradition has lasted until today!